Ready to do some learning in the comfort of your own home? Take at look at the quality Home Study courses available from KPA. KPA Member Benefit - KPA members can access each home study recording free of charge! Simply send your selections to [email protected] and you will be provided a link to the requested recordings. If KPA members would like access to the complete home study materials, handouts and CE credits, then they may purchase the home study for a discounted fee. Details about each option are included below. In this webinar series, we will be going to the “front lines” with leading psychologists who serve our service members through their research and clinical work with veterans’ mental health issues… and then bringing this expertise back into our own practices with our civilian clients. These issues - suicide prevention, sleep disturbance, family transition, traumatic brain injury, and pain management – are very prevalent among our veterans; they also are very common among the clients whom most of us see. Understanding and Treating Sleep Disturbance: Lessons Learned from Treating Veterans Presented by Adam D. Bramoweth, Ph.D. Families and Couples in Transition: Lessons Learned Presented by Steven Sayers, Ph.D. Pain and Pain Management: Lessons Learned from Treating Veterans Presented by Robert Kerns, Ph.D. 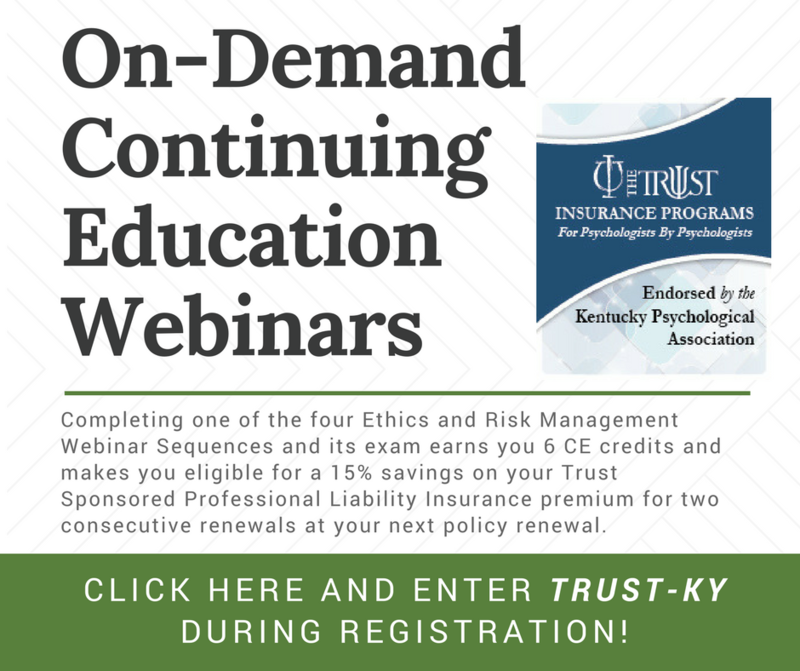 The Kentucky Psychological Association is approved by the American Psychological Association to sponsor continuing education for psychologists. The Kentucky Psychological Association maintains responsibility for the above KPA Home Study courses and their content. KPA is also approved to offer professional continuing education by the Kentucky Board of Examiners of Psychology, the Kentucky Board of Social Work and the Kentucky Board of Professional Art Therapists. Home study quizzes will be processed and certificates will be distributed within 3 business days. NOTE: Under revised KRS CE regulations, you can now earn up to 12 credits per licensure cycle for home study courses.